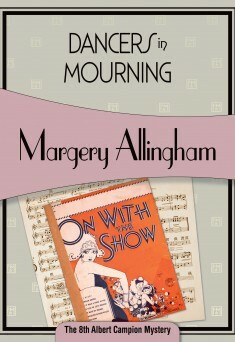 Albert Campion’s life as a professional adventurer and crime solver takes a more serious turn in this, the eighth of Margery Allingham’s Campion novels. It all begins when Campion is called on to help a famous dancer, Jimmy Sutane, find out who’s been playing pranks on him—things like altering the signs advertising his show or putting a pin in his grease-paint stick. Campion goes down to Jimmy’s home to see what he can find out. The household is filled with all sorts of theatrical characters, but the household is reduced by one when the eccentric dancer Chloe Pye is run over by Jimmy’s car. Jimmy attests that she just came out of nowhere, and it’s entirely possible that she jumped from a nearby overpass to meet her death. But could there be foul play involved? Hitherto he had been an observer only in the many dramas which he had investigated, and that circumstance had given him an unfounded sense of superiority. Tonight he felt cold and disillusioned; no longer shocked but frankly despairing to find himself both so human and so miserably unhappy. The cause of Campion’s despair is Jimmy’s wife, Linda. Campion has had brief flirtations during his past adventures, but his encounter with Linda is of another order altogether. He falls quickly and deeply, and his feelings make it all but impossible to consider the facts of the case with a calm and unbiased mind. Indeed, he has discovered his humanity. One of the reasons I decided to read the Allingham novels in order, when a lot of Golden Age mysteries don’t require such an approach (it’s not of much benefit when reading Poirot, for example), is that I’d been told that Campion grows over the course of the series. I suspect that this novel could mark a turning point in his growth, as he’s come face-to-face with his own weaknesses, and, more important, learned that the real peril in crime solving is not necessarily the physical danger it brings. Initially I read the books randomly as I came across them, and I only found this one a couple of years ago. When I did read it, then it made sense of something in a later book that had always puzzled me. Some day I’ll go back & read the series in order (I’ve still got the last two to read) – I’d like to watch how Campion changes or develops. I read several of these randomly back in the 90s, but I don’t even remember which ones! I am glad to know that this story comes up again. It seems too significant to disappear. I’m thinking now that the development is not just in Campion himself, but in Allingham as a writer. It seems like she’s wanting to go deeper with her characters. I have read a number of the Campion books out of order. I enjoyed how some of the books were humorous, and others more serious. I have not read many of the earlier ones, but I understand that most of them are more humorous. The earlier ones were certainly on the silly side–and quite a lot of fun. I really didn’t think much of the earlier character of Campion but he does seem to improve with age, I wish I had read them in order too, instead of just as I came across them. I enjoyed the earlier ones a lot–it helped that I’m a Dr Who fan and started seeing Campion as being a lot like the Doctor, playing the affable idiot and having fun while getting to the bottom of something.